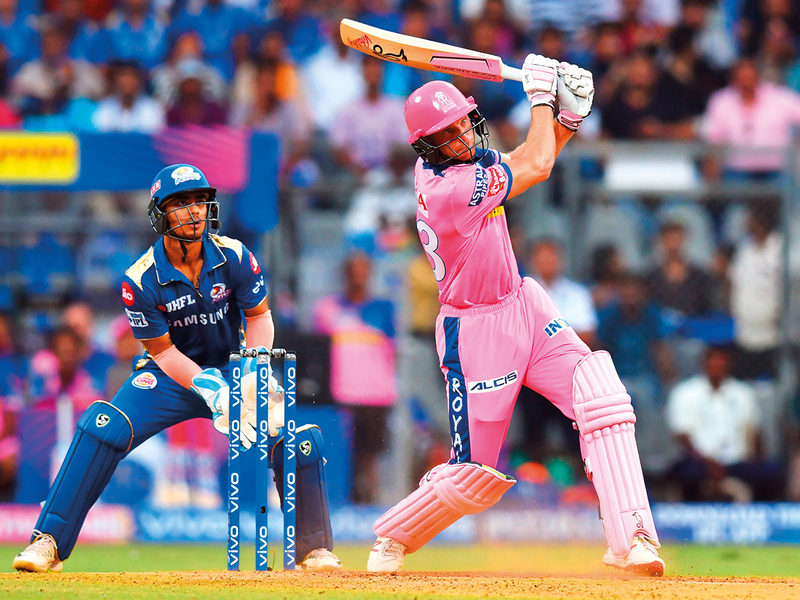 Mumbai: Rajasthan Royals finally managed to script their second victory of the 2019 Indian Premier League (IPL) as Jos Buttler clattered 89 off 43 balls before Shreyas Gopal (13 off seven) rescued his side with the bat to beat Mumbai Indians by four wickets in yet another edge-of-the-seat contest at the Wankhede Stadium on Saturday. Chasing a competitive 188 for victory, the visitors were comfortably placed at 147-1 in 13.1 overs. However, Krunal Pandya and Jasprit Bumrah rocked the Rajasthan middle-order as they tumbled to 174/6 in the 19th over before Gopal came to their rescue. Rajasthan openers Ajinkya Rahane and Buttler were off to a watchful start and maintained a decent run-rate as the scoreboard read 28-0 after three overs. The duo added another 31 runs in the next three overs before Krunal struck to send back skipper Rahane for 37. New batsman Sanju Samson, along with Buttler, kept the scoreboard ticking as they took Rajasthan past the 100-run mark in the 10th over. Buttler slowly shifted gears as he smashed medium pacer Alzarri Joseph for 28 runs in the 13th over with Rajasthan placed at 146-1. Rahul Chahar then gave Mumbai the much-needed breakthrough, as he got rid off the dangerous Buttler in the 14th over. While trying to clear the fence, Buttler holed out to Suryakumar Yadav at the long-off fence. For Mumbai, Krunal (3-34) and Bumrah (2-23) were the pick of the bowlers. Earlier, put into bat, Mumbai piled up 187-5 in their 20 overs. Quinton de Kock stole the show with the bat as he hit a 52-ball 81 to set the tone for the home team. While de Kock was dismissed in the 19th over, Hardik Pandya carried forward the onslaught to finish with an unbeaten 28 off just 11 balls.